I saw this picture before Christmas, it shows different stages of hooks and eyes being made and is dated to 15th to 16th century. 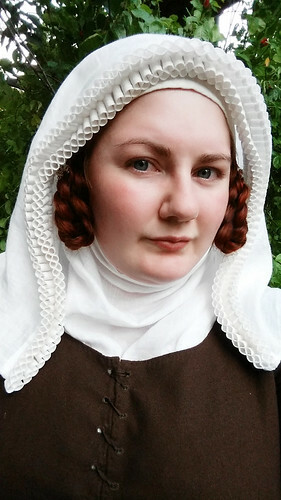 I have until now used modern black or silver hooks for my 16th century projects, lazy as I am. But Seeing the picture it hit me that it is to easy to make them on your own to not be using them. So I dug out my pliers and 1mm bronze thread and did some testing. And sure enough, they are really easy to make. 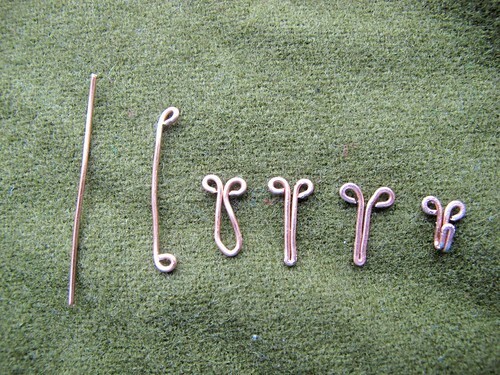 I never you the eyes, I do thread bars for my hooks in stead so I will only show the hook making part. I use bronze thread as bronze seems to be very common to use in pins and needles, so using it for hooks and eyes should be period correct. I start out with a 4cm long piece. 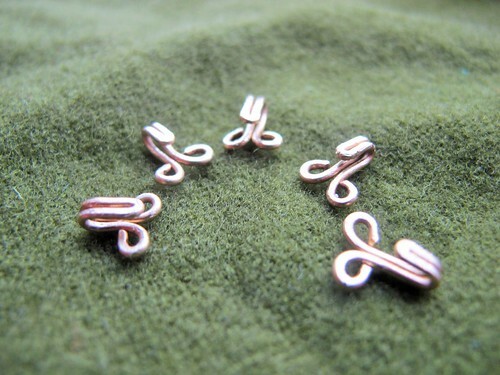 Press the wire together to make a nice shape, I use my needle nose pliers to do this. Then it is time to fold, this was the tricky part and it is hard to get it even and straight. But practice makes more perfect. Now I need to exchange the modern ones I already have in place for these nice ones.